'Shock to the System' by Catherine O’Driscoll is a sequel to 'What Vets Don't Tell You About Vaccines'. It covers the latest information on the vaccine issue, and puts the other pieces of the puzzle into the picture. Diet, environmental toxins, pharmaceuticals and stress all play a part in the health of companion animals. New updated 2nd Edition of "Who Killed the Darling Buds of May?". Veterinarians around the world were advising pet owners to vaccinate their animal companions against disease every year. In the author's opinion, annual vaccination is neither necessary, nor safe. In the revised, updated edition the author brings fresh information and explains why she feels you can protect your dogs and cats from disease homopathically, without risking their lives at the same time. The whole programme is available to view online free of charge. Courtesy of Edge Media - Controversial TV. 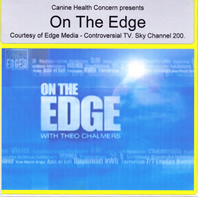 'On The Edge with Theo Chalmers' is a live interview TV programme first screened on Sky TV Channel 200 in August 2009. With guests Catherine O'Driscoll from Canine Health Concern, and american vet Dr Patricia Jordan. The programme discusses pet vaccination and natural food for animals, and associated topics.